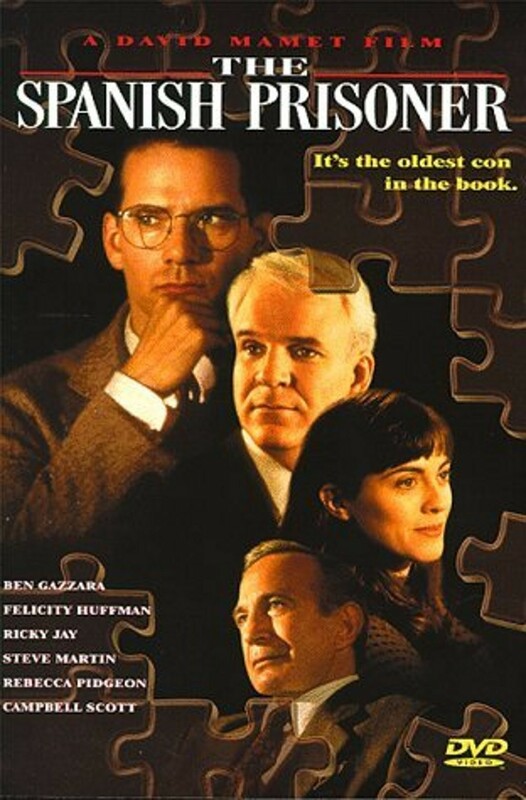 Not as well known as David Mamet’s House of Games, The Spanish Prisoner is a terrific, twisty, con-artist film. The Spanish Prisoner can also be seen as an extended metaphor for how Mamet views the entire enterprise of filmmaking. David Mamet, the writer and director of The Spanish Prisoner, is one of the most interesting voices working in movies today. David Mamet is also the greatest living American playwright. Not a week goes by that I am not reminded (by some film, essay, or conversation) of Mamet’s seminal nonfiction works, Three Uses of the Knife: On the Nature and Purpose of Drama and Bambi Vs. Godzilla. The first book is a must-read for anyone interested in fictional narrative. The second is a fun look at the author’s experiences in Hollywood, including his championing of Galaxy Quest as a paragon of narrative structure. I recommend both books without reservation. Mamet is the complete package. THE PLOT IN BRIEF: Joe Ross (Campbell Scott) has invented a “process” for his company. Joe meets successful businessman Jimmy Dell (Steve Martin) on a vacation trip, and the two form a friendship. The company is just at the point where the process will begin paying big dividends, and Joe grows paranoid that the company will not pay him his bonus. He asks Jimmy for help, and this starts an elaborate cat-and-mouse game between Joe, his company, Jimmy, and the FBI. I love any and all uses of the MacGuffin in movies. I think McDonald’s should invent a new Hitchcock-inspired menu item and call it the MacGuffin. No one ever explains what it really is, but judging by the length of the drive-thru line, everyone wants it. And it will make you as fat as Hitchcock. I have of late been enjoying a book, Celebrations of Curious Characters, by Ricky Jay. Jay and Mamet are good friends; Mamet even wrote the introduction to the book and has directed all three of Jay’s theatrical showcases. Ricky Jay appears in The Spanish Prisoner and was a special technical consultant to the filmmakers on the subject of con artists and con games. Ricky Jay’s involvement gives all the movie’s twisty bunko elements the ring of authenticity. 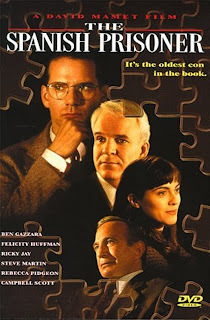 Steve Martin’s performance as Jimmy Dell is my main reason to recommend this film. Martin is such an under-rated actor, and his performance here and in the 1999 movie Bowfinger (which I have written about at some length here) and 2005’s Shopgirl reveal the Martin I really like to watch. Gone are the concessions to “likeability” and forced goofiness of his more mainstream, family-friendly films (Parenthood, Father of the Bride, and Cheaper By The Dozen); I like Martin with a little edge and a little bite. Martin’s performance in The Spanish Prisoner also reminds us that the word “con” in “con-game” originally comes from the word “confidence.” If the player does not have the innate ability to charm people, to draw them in, to gain their confidence, he will get exactly nowhere. Unfortunately, not every performance in The Spanish Prisoner resonates as well as Martin’s. Why are so many famous men driven to work with their spouses? Mamet made House of Games in 1987 with his then-spouse Lindsey Crouse, who gives a terrific, if mannered performance. Since divorcing Crouse and marrying Rebecca Pidgeon, Mamet has featured Pidgeon in all of his films. Pidgeon is a hard actress to like; her unusual acting style and speech cadences suggest that Mamet married her because she was the closest thing he could find to a living, breathing David Mamet character. Maybe it is just that she works with Mamet more than anyone else, but her stylized performance here is odd, and I would argue that her performance alone gives away what is supposed to be a major plot twist. Still, I love this film. In The Spanish Prisoner, Mamet creates one of the best metaphors yet for the process of moviemaking (something he also does in his later, more explicitly Hollywood-themed State and Main, though he does it to greater effect in The Spanish Prisoner). Film itself – as a medium, as an art – is a con artist, Mamet slyly suggests; it insinuates itself into a viewer’s subconscious, gains our trust and suggests that what we are seeing and feeling is real. In reality (real reality, not fake Hollywood reality) the movie is an illusion, created with smoke and mirrors, spit and shoe polish. When it works just right, when we are totally taken in, we are dazzled by the sheer depth and intricacy of the deception. So this is the thing? You are quite positive… this is it. The thing? Yes, this is the thing of which we speak. Just so we are sure. No, this is the thing. I am sure this is the thing. And so on for another twenty minutes. It was a hoot. Try it with friends on a lengthy road trip! The long out-of-print The Spanish Prisoner DVD goes for $64, but it returns as an affordably priced MOD title on February 5th — just three days after F This Movie Fest 2! I quite like The Spanish Prisoner. I’ve seen it three times which is usually about the limit for a con artist film (except The Sting). I think “the process” is problematic, though. Keeping it undefined, strikes me as Mamet nudging the audience and whispering “this is just a MacGuffin”. Specificity always works to ground the film more. The Glengarry leads are not intrinsically more interesting to an audience than “the process” but their specificity grants them a greater sense of authenticity. Just wanted to give some love for a movie that I thought nobody saw except me. I know, life in the suburbs can be HARD. Thanks JB. My 7-word review: What is Michael Cera's grandfather doing here?